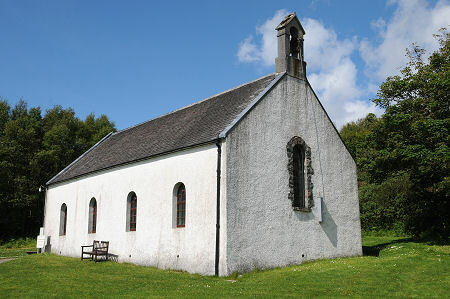 Jura Parish Church stands on the inland side of the main road up the eastern coast of Jura at the northern end of the island's only village, Craighouse. 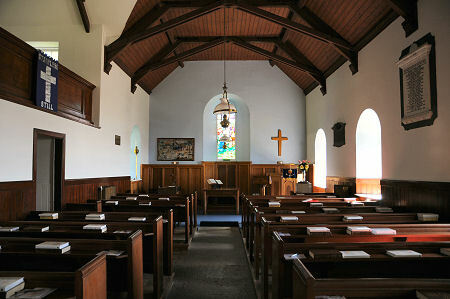 It is a plain but attractive church whose interior has a warm and welcoming feel and a number of interesting features. 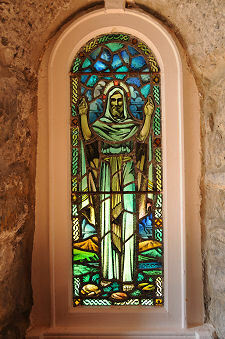 Christianity has an ancient history on Jura. One story says that St Earnadail (sometimes called St Earnan), the uncle of St Columba and one of those who accompanied him to Iona, preached on the island in the late 500s. This event is said to have taken place at Kilearnadil, still the site of the island's main graveyard and some two thirds of a mile north west of today's church. An alternative story is that on his deathbed St Earnadail asked that his body be taken to Jura and buried in the first glen where mist was found. Either way, the chapel and surrounding community that grew up there was named after St Earnadail and became known as Kilearnadil. The chapel and the settlement have long gone, but the graveyard remains. 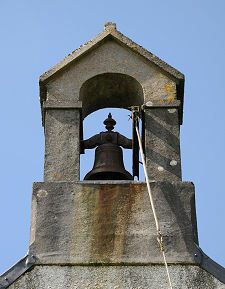 Following the Reformation in 1560, Jura became part of a single parish that also included Colonsay, Oronsay, Gigha, Scarba and other minor islands: the life of the minister must have been a particularly challenging one. In the mid 1700s the parish church serving Jura seems still to have been located near the graveyard at Kilearnadil. In 1766 it was decided to build a replacement in a more convenient location on the coast and the following year the laird, Archibald Campbell of Jura, made funds available. Despite this, it took until 1777 for the new church to be completed, at a cost of £115. The original church had no seats and no belfry, and according to one report was already in a state of disrepair by the early 1800s. The building was extensively renovated and enlarged in 1842. The church that emerged from this renovation was externally substantially the same as the building you see today. Internally, however, it was very different. The pulpit was raised and located mid way along the south east wall of the church, and there were galleries at both north east and south west ends. Directly opposite the pulpit at first floor level was the laird's loft, above what is now the vestry. The current interior of the church dates back to another refurbishment that took place in 1922. The end galleries were removed altogether, as was the raised pulpit, and the church was realigned so all the pews faced north east, towards the new pulpit and the communion table at that end. The laird's loft was retained, though now slightly oddly positioned in terms of allowing the occupants to benefit fully from the services. The stained glass window in the north east wall was dedicated in 1946 in thanks for the safe return of all but one of the Jura men who went to war. The rose window high in the south west gable was dedicated in 1954 and carries the arms of the Campbell family. In more recent times the room behind the laird's loft, accessed by means of external stairs on the north west of the church, has been used as an exhibition space for a magnificent collection of historic photographs of Jura taken from the late 1800s onwards.